This blog was originally published on foureyes.io. Tools like Google Analytics allow us to optimize marketing campaigns to get more people to the right pages. But while e-commerce practitioners have been able to track the buyer’s journey all the way through to conversion for more than a decade, automotive marketers are limited to users, sessions, bounce rate, and average session duration only down to vehicle detail page (VDP) views. It’s not good enough. This is one of the primary reasons why we built Foureyes®. To run effective marketing campaigns for our clients, we needed technology that could identify how many sales prospects—not simply how much traffic—we were producing. To address this, we built our Foureyes’ lead filter technology—part AI and part human—that allows us to distinguish quality sales prospects from all the other traffic on your website. It integrates with your CRM to give you a complete picture of prospect engagement and sales. It’s a boon for salespeople, but the information is like gold in the hands of marketers. Knowing that most marketers and many Foureyes customers’ vendor partners are more comfortable in Google Analytics, we recently developed an integration between Google Analytics and Foureyes. 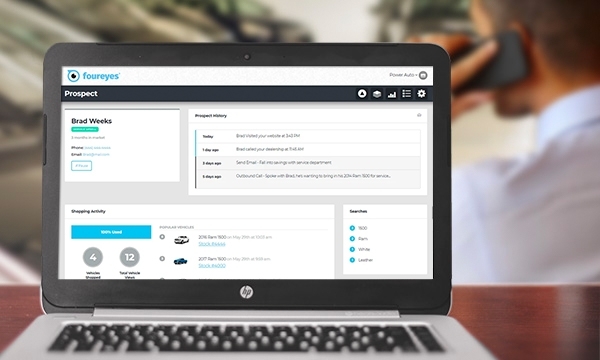 Dealers can now see Foureyes conversion data, both Quality Sales Prospects (QSP) and Cars Sold, right in Google Analytics. Through the integration, Foureyes pushes filtered data back into Google Analytics as an event that is created as a goal and feeds into all the conversion columns throughout the Google Analytics interface. Here are five of my personal favorite views and new insights available in Google Analytics now that the Foureyes integration is complete. To understand which marketing channels are performing, the first thing to check is your channel and source/medium reporting. With Foureyes data in place, the conversion columns will now be filled out with the conversion rate and total number of Quality Sales Prospects (QSPs). Most marketers pretty quickly understand the value of that near real-time conversion data. One of the major changes these insights allow for is to better influence sales while there’s still time. Using Behavior Overviews, you can see how many quality sales prospects your dealership is capturing each month. If by the 15th, you’re tracking lower than your goal, you still have time to make some marketing strategy changes and feed the funnel. Once you have traffic filtered exclusively to sales prospects, you can see what’s really going on with your site and what needs to change to improve the experience for your shoppers. Use Overview data or Behavior Flow Insights filtered to Foureyes Quality Sales Prospects to identify pages where shoppers may be dropping off to improve lead conversion rate. The attribution options in Google are extremely powerful, and once you have Foureyes QSP and sales data layered in, you can test and compare GA attribution models to determine what works best for your dealership. We find this is particularly helpful for dealers who have multiple vendors, using multiple attribution models or taking credit for the same leads. Look for the Model Comparison Tool under Attribution in Conversions. Once you have your Foureyes data layered into Google Analytics and you know your marketing spends, you can immediately start reporting on cost-per-qualified-lead and cost-per-sale at the source/medium level. True, the numbers are going to be higher than what you are used to reviewing, but it is a more accurate reflection of your performance. With that knowledge, you can evaluate if it’s time to pump up your marketing spend or refine your sales process to maximize the value of every one of your marketing leads (and psst, Foureyes helps with that too!). Sound intriguing? If you are already on Foureyes, ask your Product Specialist and they’ll get Foureyes data flowing to your Google Analytics account. If you’re not on Foureyes and are salivating at getting this level of detail, give us a call at (971) 352-3494 or shoot us a note at info@foureyes.io. Give power to your salespeople with Foureyes®. Our patented sales intelligence platform helps you sell more with complete visibility into your prospects’ shopping activities.